The Miramichi Phantoms season came to a premature end Sunday evening at the hands of the Caraquet Acadiens. The Phantoms led after both the first and second periods, but could not hang on in the third and fell by a score of 6-3. Bryce Silliker, Matthew Doherty and Jeff Wilson all tallied for the Phantoms in a losing effort, while Nick Hardy suffered the loss in goal. The Miramichi Phantoms put forward a lack luster performance in game 2 of their best of 5 series against the Caraquet Acadiens Saturday Evening. The Phantoms were on the losing end of a lop-sided 10-0 score. The Phantoms now trail the series 2-0. Nick Hardy and Marc Richard shared the duties in net. The Miramichi Phantoms let home ice advantage slip away in their best of five series opener versus the Caraquet Acadiens. The Acadiens knocked off the Phantoms by a score of 5-3 sealing the deal on an empty net goal with 36 seconds remanining. Bryce Silliker, Wesley Vye and Matthew Shannon scored the Phantoms goals while Nick Hardy was between the pipes in the loss. The Miramichi Phantoms finished off their regular season on a winning note, defeating the Causapscal Cedrico by a score of 7-3. With the victory the Phantoms locked up 4th place in the league and home ice advantage in a best of five quarter-final series against the Caraquet Acadiens. Stanson Donovan had a hat trick, while Bryce Silliker added a pair and singles came off the sticks of Jeff Wilson and Lance Woodman. Nick Hardy picked up the win in goal. In what was deemed as the "NSSHL Game of the Year" between the Miramichi Phantoms and Tracadie Alpines, did not disappoint. The fight filled contest in front of a capacity crowd finished with Tracadie narrowly edging the Phantoms 7-6. There were six different goal scorers for the Phantoms including, Stanson Donovan, Lance Woodman, Jeff Wilson, Matthew Doherty, Bryce Silliker and Kris McKay. Marc Richard was solid in goal, but suffered the loss. A $2000.00 fine was handed out to the Dalhousie Rangers as they failed to show up for their away game against the Phantoms. 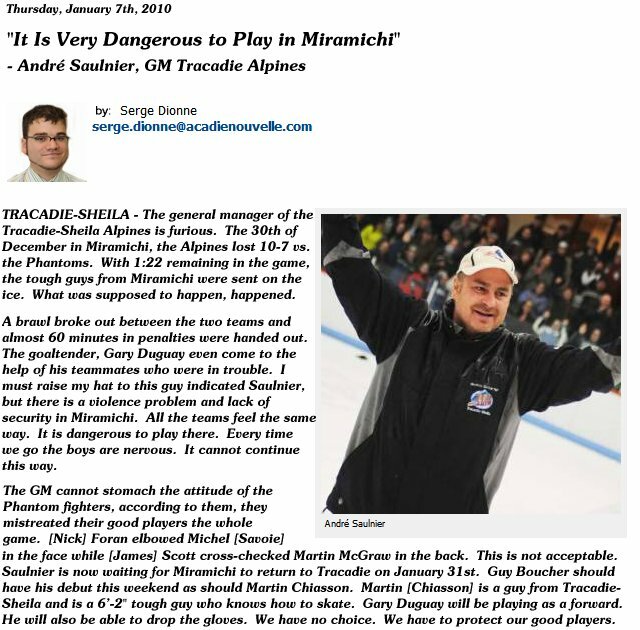 Miramichi was awarded the game and two points in the standings. The Miramichi Phantoms knocked off the Causapscal Cedrico of Quebec Saturday evening by a score of 5-2. The game was tied at two a piece heading into the third but the Phantoms pressure was too much, scoring three unanswered third period goals. Bryce Silliker and Darcy Foran both hit the scoreboard twice while Stanson Donovan rounded out the scoring. Nick Hardy secured the win in goal. The Dalhousie Rangers scored with 32 seconds remaining on the clock to edge the Miramichi Phantoms 10-9 Thursday evening, in a high scoring contest. The Phantoms would never hold the lead in the game, coming back to tie it numerous times. Bryce Silliker notched the hat trick for the Phantoms, while Wesley Vye scored two and singles came off the sticks of Nick Foran, Jeff Wilson, Stanson Donovan and Andrew Kane. Marc Richard started in goal but was replaced in the second period by Nick Hardy. The following is an excerpt from the Acadie Nouvelle newspaper. Click on the image to enlarge. The Phantoms put forth a great effort Saturday evening but fell just short to the Causapscal Cedrico by a score of 5-4. Bryce Silliker notched two goals for the Phantoms, while singles went to Jeff Wilson and Andrew Kane. Marc Richard was the losing goaltender in net. The game between the Miramichi Phantoms and the Causapscal Cedrico from Quebec, which was cancelled January 3rd has been re-scheduled. The new date is Sunday February 7th, 3:00 PM at the LBA. Jeff Wilson has once again earned NSSHL honors as he was awarded first star of the week. Wilson collected a hat trick and added an assist in the Phantoms only game of the week. Jeff Wilson fired a hat trick and added an assist to lead the Miramichi Phantoms to a 7-4 victory over the visiting Caraquet Acadiens Friday night. Darcy Foran, Matthew Shannon, Lance Woodman, and Bryce Silliker added solo markers in the win. Marc Richard was solid in goal and picked up the win for the Phantoms. Jeff Wilson was awarded second star of the week, amassing seven points in two games for the Phantoms. This is Wilson's second star of the season. In an emotionally charged game, the Miramichi Phantoms managed to hold off the Tracadie Alpines for a 10-7 victory. The Alpines left the ice in the third period, with over a minute remaining on the score clock, after a line brawl erupted in front of the Tracadie bench. Jeff Wilson tallied a hat trick for the Phantoms, while Bryce Silliker netted a pair, with singles going to Nick Foran, Stanson Donovan, Andy Kane, Adam Matchett and Darcy Foran. Nick Hardy was the winning goaltender in net. The Miramichi Phantoms could not hold on, as the Tracadie Alpines scored late in the third period for a 5-4 victory Sunday evening in Tracadie. Stanson Donovan lit the lamp twice for the Phantoms, with singles going to Jeff Wilson and Nick Foran. Nick Hardy was solid in goal, but suffered the loss. The Miramichi Phantoms three game winning streak came to a hault Wednesday evening at the hands of the Caraquet Acadiens. The Acadiens defeated the Phantoms by a 7-4 score. Jeff Wilson, Bryce Silliker, Lance Woodman and Stanson Donovan all had markers for the Phantoms, while Marc Richard suffered the loss in goal. Wesley Vye scored 2:21 into overtime to give the Miramichi Phantoms a come from behind 6-5 victory Tuesday night. Jeff Wilson and Stanson Donovan both added a pair of goals while Bryce Silliker rounded out the scoring. Nick Hardy cemented his third win in row, in goal. The Miramichi Phantoms made it two home wins in a row Saturday night, with a spirited 6-4 victory over the Causapscal Cedrico of Quebec. Stanson Donovan powered the Phantoms with two goals, while singles went to Jeff Wilson, Darcy Foran, Matthew Doherty and Bryce Silliker. Nick Hardy was in net and recored his second win of the weekend. Behind a solid performance from winning goaltender Nick Hardy, the Miramichi Phantoms dropped the Dalhousie Rangers Friday night by a score of 5-2. Nick Foran and Wesley Vye each netted a pair of goals and Joey Traer rounded out the scoring in the Phantoms victory. The Phantoms dropped a close 5-2 game on their trip to Quebec Saturday, against the Cédrico. Causapscal scored two unanswered third period goals to seal the win. James Scott and Joey Traer scored the Phantoms two goals while Nick Hardy was between the pipes in the loss. The Miramichi Phantoms fell 6-1 at the hands of the Dalhousie Rangers Thursday evening. The game was dead locked at zeros after one, and the Rangers took a 1-0 lead into the third period, where they added another five goals for the victory. Zach Dalton scored the lone goal for the Phantoms while Marc Richard was handed the loss in net. For the second time this season, Stanson Donovan has yielded NSSHL honors. Donovan picked up 3rd star this past weekend accumulating six points in two games. In a hard fought Sunday night battle in Tracadie, the Miramichi Phantoms ended their losing drought with an impressive 6-5 victory over the Alpines. In this spirited affair, the Phantoms managed to hold onto a 6-4 second period lead holding Tracadie to one goal in the third, for the 6-5 win. Marksmen for the Phantoms were Lance Woodman and Stanson Donovan with a pair each, while Jeff Wilson and Bryce Silliker had singles. Nick Hardy was solid in goal with the victory. The Miramichi Phantoms battled hard but were un-able to pick up the extra point, in a shoot-out loss to the Caraquet Acadiens Saturday evening. After three periods of play and a five minute overtime, the game was dead locked at three. Phantoms shooters were unsuccessful and lost the shoot-out 1-0. Darcy Foran, Jeff Wilson and Kris McKay were the goal scorers as Nick Hardy took the loss in goal. The Tracadie Alpines handed the Miramichi Phantoms their fifth consecutive defeat on Friday, by a score of 10-5. The Phantoms dug an early first period hole, on four Tracadie power play goals, from which they could not recover. Goal scorers for the Phantoms were Bryce Silliker with two, Lance Woodman, Zach Dalton and Jeff Wilson. Marc Richard was the losing goaltender. The Miramichi Phantoms visit to the Inch Arran Ice Palace in Dalhousie was not a productive one. The Phantoms were on the losing end of a lop sided 9-2 score. Jeff Wilson and Stanson Donovan were the goal scorers for the Phantoms while Nick Hardy took the loss in goal. For the second week in a row the Phantoms have garnered NSSHL honors. Picking up first star of the week was Stanson Donovan with an impressive seven points in two games. Collecting second star of the week was Bryce Silliker with 5 goals and one assist on the weekend. Congratulations to both players. In a rough and tumble match-up between the Miramichi Phantoms and Le Cédrico de Causapscal, which included four fights, the Phantoms came out on the losing end of a 6-2 final. Jeff Wilson and Bryce Silliker had the Phantoms goals, while Marc Richard suffered the loss in net. The Miramichi Phantoms gave up a 3-0 first period lead in an 8-5 loss to the Tracadie-Sheila Alpines Friday night. The pentaly filled affair included a line brawl in the second period. Jeff Wilson and Darcy Foran scored a pair for the Phantoms while Tyson Donovan had a single. Nick Hardy took the loss in goal. The Phantoms quick start into the 09-10 campaign ended Saturday evening with an 8-5 loss to the Caraquet Acadiens. With a shortened bench the Phantoms could not hold off the Acadiens attack as their record drops to 2-1. Bryce Silliker led the Phantoms with four goals and Bryan Brown had the other marker. Stanson Donovan and Jeff Wilson both recorded three assists. Orry Cook took the loss in goal. The Phantoms would like to congratulate Jeff Wilson on receiving first star honors this week in the NSSHL. Jeff scored 3 goals and added an assist in the Phantoms home opener. The Miramichi Phantoms made it two wins in a row to start the season, as they defeated the Dalhousie Moosehead Rangers by a score of 5-1 on Friday night. Starting goalie Marc Richard had a strong outing, and Stanson Donovan fired two goals with singles from Nick Foran, Darcy Foran and Bryce Silliker for the win. The Miramichi Phantoms started their season on a winning note. Downing the Grand Caraquet Acadiens by a score of 7-3. Newcomer Jeff Wilson led the way with 3 goals while single markers were notched by Zac Dalton, Wesley Vye, Stanson Donovan and Bryce Silliker. With the Phantoms improved line-up they look to continue their success next Friday, Nov. 13th as they play host to the Dalhousie Rangers.